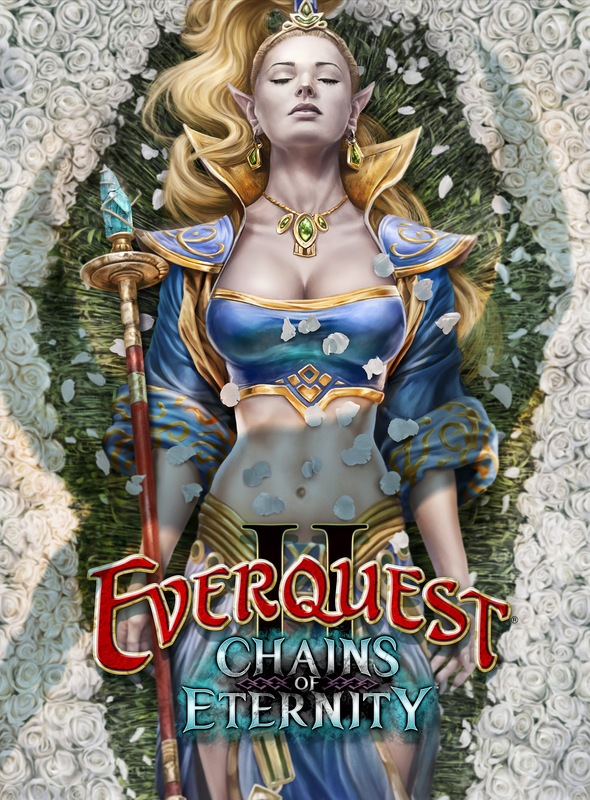 I just received an e-mail indicating that the new Chains of Eternity expansion is available for pre-order at EverQuest2.com. Introducing Everquest II: Chains of Eternity™! This is the 9th expansion of the revolutionary EverQuest II franchise. This expansion contains must-have features such as level increases, prestige abilities and new game items only available with this expansion, such as adornments that become more powerful with your character. Also, explore new content in two overlands in the spirit realm, and experience adventure with new dungeons and quests. Put right the imbalance in the Ethernere! Spirit Stones – New adornments that gain experience with you and grow in power. All level caps raised to 95 – Whether you are a Guild, Adventurer or Tradeskiller you are now able to experience Norrath at the highest level possible. No word on raid zones or whether the expansion will include prior expansions. Price was lower when I clicked on buy(pre-order). @Uberfuzzy: Pretty sure they announced a while back that they were done with non-digital versions and that all future expansions would be digital only. I could be mistaken though. Too bad it is digtal only, but I guess that way they save money on shiping to brick and mortor stores. I’m quite amused by that box art. Anyone else notice the shadow over Firiona? Is that a dragon claw… A spiked helm? While Sony still has the muscle to get boxes on store shelves, outdated expansions hanging around can become problematic. Vendors either want to return them, or they sit around, like at my local Fry’s, very obviously collecting dust. Besides, when you have a free to play online game with a free client download, I think you are probably better off committing to digital only. Maybe you throw a special starter pack box on the shelf like EVE or World of Tanks. I am kind of wondering about the Firiona Vie necro aspect of the art choice. Is the dead standard bearer of the EQ product line a better choice than any of the living post-cataclysm NPCs? Or is she just sleeping? Will we have a sleeping beauty-like heritage quest? Yep they double-discounted it. Until they change it, looks like you can get the regular for $29.99 and the CE for $44.99. As far as boxes, even with a gun pointed at players heads with the 7 day head start for Sentinel’s Fate, they still didn’t move enough retail boxes to justify it. Digital is the future. Looks like a cresent moon on the end of a staff to me. Guess they aren’t doing the expansion for station cash this time around? As for the expansion notes…”Every area of Norrath has its own home in Ethernere” might mean that we’ll be with this expansion theme for some time while they release every/most old zone in Ethernere format starting with Feerrott. it looks like the CE is mainly just an extra $20 for a merc. Where do you pay only $29.99? The pre-order link from the SOE email asks me for $39.99. Can this be purchased with Station Cash? Feldon, thanks for such a rapid response but that link shows $39.99 for me, did I just miss a lower price by a couple of hours? The standard edition shows $39.99 and collectors $59.99 for me ? I am Gold account been playing for years, not sure why I can’t see the lower price unless its a fan-faire thing ? What happened to not having to pay for expansions until 2013? It’s the same for me. Looks like they changed it back to 39.99 and CE for 59.99. @Spakka Maybe they fixed their extra discount. I just preordered the Standard Edition and was charged $39.99. Tylia, OK thanks, it must have been a mistake, looks like a lucky few got a bonus discount! Any details on the merc? It seems to be the only reason to get the CE. Be nice if we knew what class the merc is, and what the banner thing also from the CE looks like. The lack of screenies and info is annoying. They already said that they are not doing SC for expansions. You must have been away in Star Wars or something. They want cash and that is how you will have to buy it. At least until not enough buy it and then maybe they will change there mind. Right now most of the collectors edition is garbage. All the SC trash they throwing in is not worth anything. So a merc and a tapestry is what yo uare paying 20 for. Now maybe they will give us some screenshots, but I dobt it until after SOE Live. when I read the “knowledge base” it said you can’t Pre order with STation CAsh. I must be taking it too literally then. But I would be fine without Pre-Order. Don’t much care about all the potions etc. Just want the expansion and I don’t want to use the credit card. You cannot buy expansions or subs with SC at all anymore. They did away with that completely. So will this expansion be useless to those who do not have a character at max level? This will include AOD right? So if it dont inclued Age of Discovery the player with Colector edition will not be allowed to use his mercenary right ? I am trying to sort this out via sOE too, but how come credit cards are the only way to purchase? What if you don’t have one, what if you don’t have ATM. Is the world now that everyone has a credit card? i am surprised, sort of. AND I don’t want to use my credit card to buy the expansion. I liked taking cash to Game Stop and buying it. @Bob same here. A good heroic progression is really all I play for these days, so 9-but-actually-3 dungeons won’t cut the mustard for me (not for 40 bucks at least). I’m pretty worn out with soloing in EQ2, especially after having played 2 recent MMOs that I find more fun to solo. I still like grouping in EQ2 the best, tho. I don’t see how the discounted price is coming up for some. I have tried to order on line and it says $59.99 right up to finalizing the purchase. Any help would be appreciated. Too bad that station cash can’t be used for purchase. I’m really beginning to doubt continuing with EQII. Have been a gold member for some time now. Seems like the least SOE could do is to allow gold members with auto-renew memberships to purchase with SC. They’ve got my money already. Seems like trying to squeeze the last bit of blood out of a stone. I have the same problem, I went to buy the expansion for two accounts and the price for one was $45 and the other $60 it made no sense at all however someone pointed out that it is the “all access” accounts that seemingly get the cheaper price while “gold” accounts pay the $60. No idea if this is true or not but that is how it worked out for me. I would be curious how many people are actually looking to buy the collectors edition. As of right now, unless that merc and tapestry are amazing, it is not worth it. We have purchased the CE for all four of our accounts for as long as we have been playing. But… I think that has ended. No house, no mount, not enough to pay money for. It’s not really about the money, it’s more that the whole game seems to be on a downslide and I just can’t see rewarding poor effort with more of my money for a subpar product. I am finding it difficult to keep interested and am logging on less and less. I don’t feel like raiding, grouping, tradeskilling, etc… Playing is feeling like a chore and I never thought that would happen. I am hoping that they add some more to the CE but truthfully at this point I am only even purchasing the basic expansion to keep up on levels just incase the fun comes back some time in the future. I am similar. My wife and I both used to play at least 6 nights a week (instead of watching TV). We now play 1 or 2x per week…and pretty much only at raid times. I changed new jobs, so I’m much busier with work I could be doing instead of playing…but I’m just not missing the play time all that much. You’re right about it feeling more like a chore than I ever thought possible. Maybe Feldon will knock some sense into the devs @ Fan Faire (or whatever the heck they call it now). I’m surprised they will not include AOD, I’ve been holding off as there really is not enough to interest me (Took a 6 month break). Now I probably just won’t buy either expansion, been doing fine without it. I wouldn’t mind a merc, but it’s not do or die. I was an SOE Live Attendee. Thought I heard a DEV mention in a panal that the SOE Live Attende’s would get the collector’s edition of COE at a discount. Is this true? There will be an upgrade available. BTW, I’m not a newbie either. Been playing devotedly for almost four years now, but I don’t buy every expansion pack, at least not until they’re included in a later one. I play for the story line, not to power level. Of my family’s 14 characters, my highest level one is 68, with the others in the 40s. We take our time, and immerse ourselves in the story and exploration. This latest expansion pack simply lacks any content that I can use, and I’m sure as heck not paying any more for it than I already have. If this is the future of SOE’s games, I won’t renew next time. It’s been fun, but it’s not fun anymore. More like a chore.